KARACHI: Shaheen Air risked lives of hundreds of passengers by operating a plane with faulty engine on a Manchester-bound flight from Islamabad, Geo News has learnt. 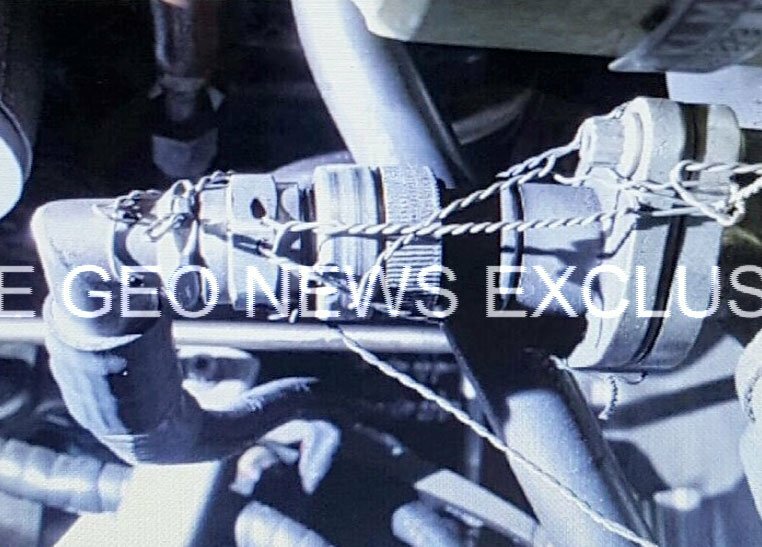 Geo News has received a picture from a responsible official of Shaheen Air that shows an engine part tied with the help wires and a chain. The picture is from the engine of Airbus A-330, having a capacity of 300 passengers, with a registration number APBML. On January 3, the plane operated a flight from Islamabad to Manchester, during which the captain reported a malfunction in engine's fuel quantity indicator. Upon checking the engine, it turned out that an important part of it was tied with the help of metallic wires and a chain. Due to this, the return flight was cancelled and the plane was grounded. After remaining grounded at Manchester airport for five days, the plane once again took off on a ferry flight to Lahore on January 8. During its flight to Lahore, the pilot was cautioned of suspension of engine's fuel filter, at which point he cut that engine and operated the flight on a single engine. Upon landing at Lahore airport, the plane was grounded and it is still stationed at Bay 20 of the airport. Sources confided to Geo News that officials found metal splinters inside the room, which meant some parts of the engine were torn. It was further revealed that the plane conducted several flights in same condition, risking life of tens of hundreds of passengers. Here a big question is as to what the Civil Aviation Authority has been doing. How does its air worthiness inspectors allow such planes for operating flights and are these inspectors credible enough for such a job? Another question is how long private airliners' engineering departments will be allowed to function with such poor flying standards? The CAA maintained silence when reached for a comment. While Shaheen Air entirely rejected the claims saying that the picture of engine being shown is not from one of the planes in its fleet. They said it is wrong to link the faulty plane to the airliner.